Its long-winded, repetitive and exhausting but I triedgrappling with Kasperism. Fr Raymond De Souza asks the question in the Catholic Herald to which all Catholics would like an answer, despite the unfortunate fact that Pope Francis, not a week into his pontificate, delivered the answer when he recommended Cardinal Kasper's book, entitled 'Mercy', to the Faithful gathered in St Peter's Square. Nicholas Bellord's latest piece detailing the events and speakers at the recent Shadow Synod is enlightening. His latest piece for the Guild of Blessed Titus Brandsma can be read here. Happy Feast of St Pius X for tomorrow! Happy Feast, everyone, and don't forget to put the 'World Day of Prayer for the Care of Creation' into your calendars. It all gives a different perspective to Pope Pius IX's rallying cry, “Give me an army saying the Rosary and I will conquer the world.” It also makes me think that Rome has perhaps reached a new understanding with the powerful of this World about just what constitute grave sins against nature. 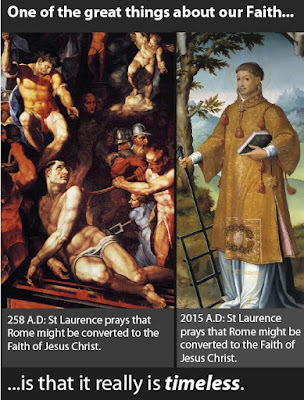 St Laurence is still praying for the Church of Rome, let us rejoice in that today. May his prayers aid the Pope and the Bishops to proclaim that Faith that saves, that Life which is eternal, that joy that cannot be robbed from man, that truth which sets us free: Jesus Christ.